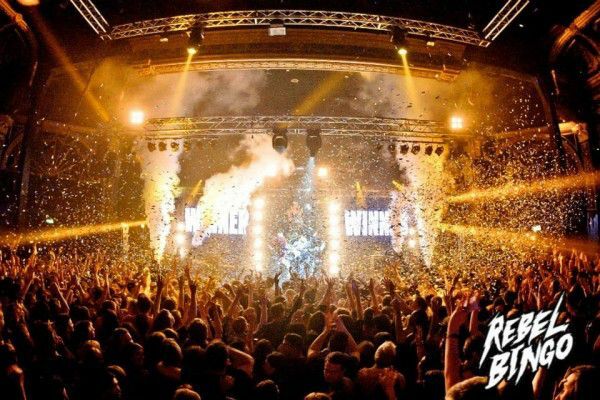 Rebel Bingo is back and just in time for the party season with London, Brighton, Bristol, Manchester and Nottingham shows confirmed for November and December. Tickets for London’s November dates are on sale now from Rebelbingo.com. Rebel Bingo has mutated into a dance floor beast selling out parties in 30 cities across five countries. Whether in its hometown of London, New York or LA the concept is universal – two games of bingo inflated to gargantuan proportions by a cast of dancers, callers, hosts, DJs, glitter cannons and giant cuddly pandas. Prizes of guitars, bikes, jukeboxes and even a trip to New York have been given away to lucky winners amongst the crowds of thousands. As well as crawling the globe with their unique brand of hedonistic entertainment, Rebel Bingo brought the madness to festival fields with shows at Leeds, Secret Garden Party and The Masked Ball this summer. Fans and would-be players are warned, tickets do not hang around for long. In a scrum to rival the demand for Glastonbury tickets Rebel Bingo shows often sell out in just minutes. In their own words, “Play hard. Win Big. And don’t bring your Grandma”. The tour visits Bristol on Friday 28th November – as you’d expect it’s already sold out but we have blagged TWO pairs of tickets to giveaway, just fill in your details below and enter by 10am on Thurs 27th Nov..